We service many of the Sam's Club Trampoline models including this BAZOONGI TRAMPOLINE. This section includes Projump - Jump Pro trampoline replacement parts for the 15' Bazoongi Trampoline "only". The diameter measurement from outside of the frame is a 15' round trampoline. There are many different model 15' trampolines. 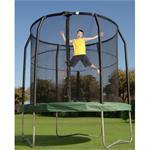 If you are unsure, please e-mail us with more descriptions about your trampoline and the replacement parts needed. ONLY Bazoongi Trampoline Replacement Parts are in this section! This section includes Bazoongi trampoline parts for round models.